Renewable energy is about more than just saving money on utility bills, even though this is a great incentive to invest in the use of it. More than the financial incentive, it’s about saving the environment and creating a cleaner future for our families. Whether you want to protect the environment or simply save money, we encourage you to do both! 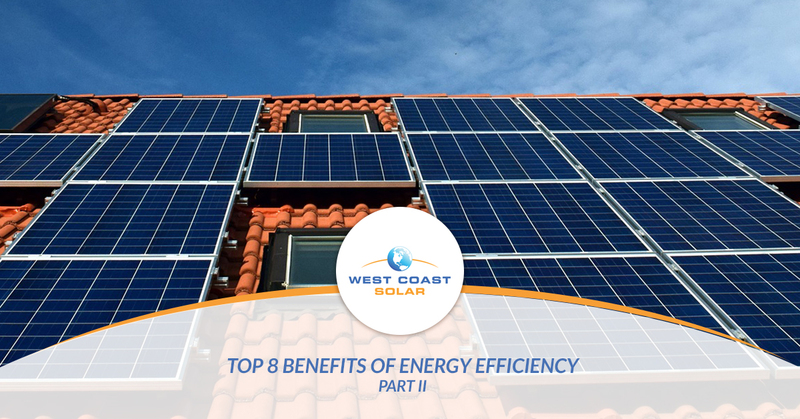 At West Coast Solar, we’re all about energy efficiency and how we can help homeowners produce their own energy with solar panels, making their homes more energy-efficient. In part one of this blog series, we shared four benefits of home energy efficiency, and in the following post, we will discuss four more ways you will benefit from your home energy efficient. Did you know 29 percent of greenhouse gas emissions in 2015 came from electricity production by burning fossil fuels, and 12 percent of greenhouse gas emissions came from homes and businesses? This means that home upgrades for energy efficiency and solar energy system installations can drastically reduce the energy consumption effects on the environment. The EPA offers a great online tool you can use for free to estimate your household carbon footprint, which allows you to compare your home’s energy usage to various homes using renewable energy. As homeowners search for ways to create a more energy-efficient home, they will find various technologies to accomplish their goals. One of those tools is a programmable thermostat. Many of the new thermostats can be accessed by an app in one’s phone, using data and information to make the best energy use decisions possible for the home. There are more technologies you can add to your home for energy efficiency purposes, which we discussed in another blog post. As you upgrade your home and invest further into energy efficiency, you will begin to see incremental returns. On the low side, you may see a few dollars annually from replacing the lightbulbs in your home. On the high side, re-insulating your attic or adding a solar panel system to your home could net you hundreds of dollars annually. Nonetheless, the more you invest in energy efficiency for your home with appliances, structural upgrades, or renewable energy production, you will see savings and potential returns on your investment over time. Across the nation, energy costs are on the rise. In California alone, energy costs are rising substantially, and the best decision is to invest in renewable energy to avoid paying rising energy costs. Nonetheless, when you create a home that’s energy-efficient and utilizes renewable energy, you protect yourself from the volatility of the traditional fossil fuel energy market. Switch to solar energy, upgrade your home for energy efficiency, and you’ll ultimately increase the quality of your life. West Coast Solar Serves You! While we understand that you may still be considering making the investments into home energy efficiency, West Coast Solar is here to encourage you to answer “yes” to the decision. We believe renewable energy is the future, and we want you and your family to benefit from energy efficiency as much as possible. You will be able to save money, protect yourself from rising energy costs, and create an environmentally-friendly future for you and your family. If you missed part one of this blog series, read it now. Or, if you’re ready to make the switch to renewable energy, give us a call today so we can start on your solar panel project!